This started with the great scooped neck tee from LVS (Liquid Velvet Studio correction). This looks exactly like something I would wear/ have worn in real life. Only 90L, I had a lot of trouble choosing a color. Many of you probably recognize ETD’s Luth hair but now it’s in the new dirty texture. *User does happy dance* While it’s true that my visit to the ETD store was lag-filled, it’s ETD, there were 500 people there. The store was well labeled and organized for camera shopping. 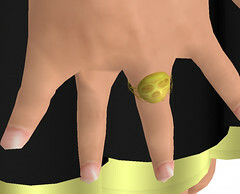 Caliah Lyon of Muse has released a couple of inexpensive items: the ring is 10L and the necklace is 1L. Perfect for everyone. Her work is just exquisite, it tends to leave me with visions of Dr. Zhivago or the crown jewels in the Tower of England. My overnighter is Mercury’s doctor’s bag. 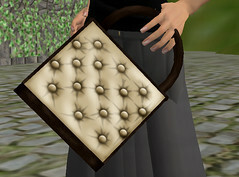 I’ve always loved the shape of a doctor’s bag and I couldn’t resist one in sl with this kind of texturing. I do need to point out that there’s no built in ao. I’m spoiled and expected one. However, Reel Expectations’ purse ao seems to do well. I know I’ve been a slow blogger lately, but I have been totally uninspired. Today I have been a little inspired. Here’s some of the Mercury outfits. The first one is the Neo-Amelia (which was dropped on me, but the rest of the items in this post I purchased myself). Crescendo is probably my favorite of the Mercury collection. This is a neutral color outfit. This is probably also my favorite handbag from the current collection. Mercury has been intriguing bloggers and slowly whetting our curiosity. So here’s my photos. Here are some necklaces I’ve been meaning to get around to. This is from Mercury in Silver & Pearl. Quite interesting and I loved it. 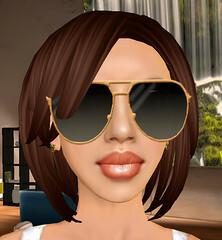 You are currently browsing the Mercury category at SL Fashion Notes.